In a city like Phoenix that is the largest geographically in the nation, getting around is not an easy thing to do. Having a home that is in close proximity to public transportation can increase property value as it gives the potential homeowner other options of getting around. That’s why Scottsdale’s refusal to help with getting the light rail project under way is surprising. A divided Scottsdale City Council on Tuesday quashed plans for three potential light-rail routes along Scottsdale and McDowell roads, meaning Valley Metro trains will not be rolling into the city anytime soon – and perhaps not ever. Scottsdale leaders for years have resisted joining the Valley’s regional light-rail network, which began service in Phoenix, Tempe and Mesa in 2008. But the proposed inclusion of rail routes in a new Transportation Master Plan this year sparked debate about whether the time had come to reconsider. The 20-year master plan guides city policy for roads, trails and public transit such as buses and trolleys. Scottsdale’s Transportation Commission in January voted to include rail connections to the existing Valley Metro line. Two proposed routes would have ended near Scottsdale Fashion Square mall in downtown Scottsdale, while a third followed McDowell Road past SkySong to the General Dynamics facility. Council members weighed in on the idea at an informal work session at City Hall on Tuesday. A final vote will come later, but the Council gave clear direction to remove the rail routes and any mention of light rail from the plan, Scottsdale Transportation Director Paul Basha said. Councilwomen Virgina Korte and Linda Milhaven both argued in support of including the potential routes to keep the city’s options open and encourage further discussion and study. Scottsdale Mayor Jim Lane cited a potential $500-million cost and the city’s need for other transportation improvements among his concerns. It’s unclear how rail construction could be funded in Scottsdale, but Lane suggested the financial burden would fall to city taxpayers with perhaps some help from federal funding. He also suggested new transportation like self-driving cars could soon make light rail obsolete. “That may sound a little Space Age or George Jetson, but there are a lot of things that are developing very rapidly,” Lane said. Including the routes would not have guaranteed light rail’s arrival in Scottsdale, but it would have marked the first real step in that direction. 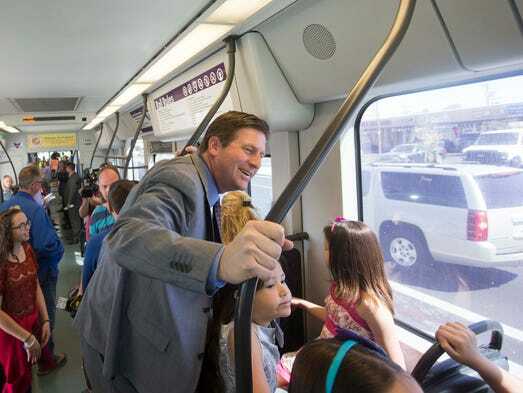 Scottsdale sent a clear message in 2009 when the City Council voted to end its membership on the Valley Metro Rail Board of Directors, saying the $50,000 annual membership fee made no sense because the city had no plans for light-rail tracks. Light rail – or the general concept of high-capacity transit – has strong support among some Scottsdale leaders. A group of business leaders that included the Scottsdale Area Chamber of Commerce, Scottsdale Community College and ASU SkySong earlier this month wrote a letter supporting the inclusion of high-capacity transit in the master plan. The new proposal included yellow, blue and red rail lines – each about 6 miles long and connecting to Valley Metro’s existing route.